Venice: Tickets for water buses 2019: Day tickets, Ticket for 48 hours and 72 hours, all information about tickets for ferries (vaporetto) in Venice. This article deals with tickets for public transport in Venice and is intended to help tourists find the right ticket. As there are hardly any roads in Venice, the tickets are mainly intended for waterbuses (public ferries, scheduled ships). However, most tickets (such as day tickets) for local public transport in Venice are also valid on buses and trams in districts with roads on the mainland and on the island of Lido. You can also use the Venice Day Pass to travel by bus and tram from the mainland over the bridge to the island of Venice. What do you need the ferries for? 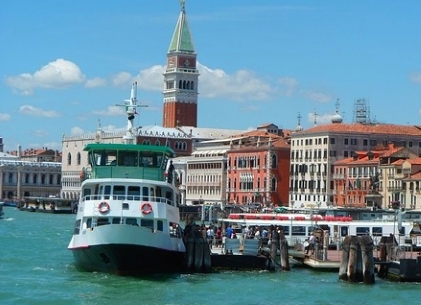 Tourists need the water buses especially to get from the main island (centro storico) to the other islands of Venice. 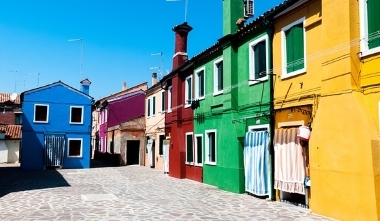 These are for example the islands Murano, Burano, Lido di Venezia or Giudecca. But also within the old town the water buses are often very useful. From one end of the old town to the other you can walk for about an hour or a bit more. Thus, also within the main island, the water buses make sense. Moreover, it is a great experience to go up the Canal Grande with the ship. Since the single tickets for the vaporetti (Italian name for the water buses) are not very cheap, most tourists buy time tickets like day tickets and especially multi-day tickets. We recommend the tickets for 48 hours, 72 hours and (in case of a long stay) one week. A single ticket costs at least 7.50 euros (in beginning of 2019). This is extremely expensive and prices are constantly increasing. Thus, if one goes by vaporetto from the hotel to a Venetian island or sightseeing place with two people, one gets rid of 15 Euro (only for the way there, 30 Euro return). A ticket for a single trip in Venice is only valid for 75 minutes. A 24-hour ticket costs around 20 euros, a 48-hour ticket around 30 euros, a 72-hour ticket around 40 euros and a 7-day ticket around 60 euros (prices in year 2017). Prices are constantly rising, and tickets will probably soon become more expensive. Despite the high prices, the water buses are very often overcrowded There are simply no alternatives in Venice exept walking or swimming. The water taxis (taxi boats) are much more expensive. Day tickets and multi-day tickets are valid not only in water buses, but also in buses and trams. Thus with a ticket, one can also go from the mainland to Venice for free. Tickets for 24, 48, 72 hours etc. are valid on almost all vaporetti lines (water buses). For example, you can visit many islands and go around the main island Venice and go up and down the Canal Grande as often as you like. But you cannot use some of the rare water buses to the mainland (exeot to Punta Sabbioni) and also, very important, not to the airport. But the day tickets in Venice are valid in the buses and trams over the bridge from Venice to the mainland (to and in the district Mestre) and on the islands Lido di Venezia and Pellestrina (the inly 2 islands of Venice with roads and buses). Again, the Vendig day tickets are not valid for trips with the public bus to the airport. To the airport Venice Marco Polo you have to pay as a time ticket holder in Venice always extra, no matter by bus or boat. Some tourists take a comfortable taxi boat to and from the airport. Also you can buy tickets fot the airport bus online on this website in English language. Buy a ticket for 48 or 72 hours on the internet before your trip and have a look at the interesting islands during this time. In 2-3 days you can visit many of the islands. Within the old town of Venice you can also walk. So you don't necessarily need the water buses in the days when you don't visit any other islands around Venice. But it is quite far on foot to the back parts of the main island (partly more than an hour from the train station). A trip with the public boat in at least is of course advantageous. Walking through Venice is very exhausting in the long run. 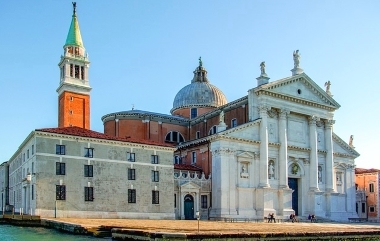 The island of Giudecca with its beautiful church can only be visited by boat.